Is I suspected they would, Microsoft has released an h.264 codec extension for Google Chrome to support h.264 in the <video /> tag. They provide the same mechanism for Firefox. This Extension is based on a Chrome Extension that parses HTML5 pages and replaces Video tags with a call to the Windows Media Player plug-in so that the content can be played in the browser. 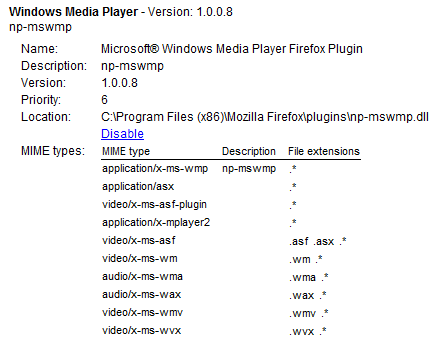 The Extension replaces video tags only if the video formats specified in the tag are among those supported by Windows Media Player. Tags that contain other video formats are not touched. The Extension also checks if the browser version already supports MP4 (H.264) video codec, if so the extension is not used. Any browser running on Windows can play H.264 video via the built-in Windows APIs that support the format. Our point of view here is that Windows customers should be able to play mainstream video on the Web. Microsoft has created yet another SKU for Visual Studio 2010, Ultimate Edition. Rather than being features extending the base IDE, there are entirely separate Express IDEs for each language. No support for solutions which contain projects written in different languages (because of item #1). No MS Office development support. No VSIX extensions (like this spell checker). And apparently, you don’t have access to F# and IronPython languages with any Express edition. What? Visual Studio Professional is the vanilla full-featured version of Visuals Studio 2010. Visual Studio is really the mechanism by which developers add value to Microsoft’s platforms. It is used to build applications that people actually use. We are not living in the gay 90s anymore when compilers were generally very expensive and IDEs were new and a huge value-add. Now, every platform vendor I can think of except for Microsoft gives away the best development tools it can in order to draw developers to it. Apple gives away XCode and all its developer tools and documentations to anyone that registers. Eclipse is free and open source. Visual Studio Express editions do not have parity with the features of XCode, Netbeans and Eclipse. Visual Studio Professional is much closer. But to get Visual Studio Professional, you have to be student or faculty at an institution participating in the Microsoft Academic Alliance program, an employee of a Microsoft Certified Partner or you or your employer have to buy an MSDN subscription every year. There are now 6 MSDN subscription SKUs. These range in price from $699 to $11,899 retail with the “Professional” version weighing in at $1,199 ($799 for a renewal). The Operating Systems one doesn’t even come with Visual Studio which makes no sense at all. Why offer developers a subscription to your operating systems without giving them the tools to develop applications on the operating systems? This state of affairs is out of control. I don’t have any issue with Microsoft selling value-adds over and above of Visual Studio Professional (e.g. Premium, Ultimate, Professional Tester, Team Server, etc.) to compete with IBM Rational and Perforce et al in the application lifecycle management and enterprise architecture modeling stuff and build management and testing. But rather than trying to squeeze 800 bucks a year out of developers, Microsoft should discard the Express editions of Visual Studio and make Visual Studio 2010 Professional available at no cost to anyone with a valid copy of Windows. Otherwise, Microsoft is literally driving startups and young developers to other platforms which offer fully functional free tools from vendors like Apple, IBM, Oracle (Sun), Novell, Red Hat and Canonical. And when I say free I don’t mean crippled or ad supported. In order to keep the Windows platform relevant, Microsoft needs to make credible modern tools available to anyone that might be interested. That means Visual Studio 2010 Professional should be a free download.